“All I needed was someone to give me a seed of hope,” says Tarra Simmons, who has overcome a history of crime and substance abuse. Since serving prison time, she has excelled in law school, passed the bar exam, and will be sworn in as a lawyer on June 16. The question before the state Supreme Court was pretty straightforward: Was Tarra Simmons truly redeemed, or a risk to the honor and dignity of the legal profession? Just five years before, Simmons was a meth addict who had people shoplift for her so she could sell the stolen goods and support her habit. She was arrested, served 20 months in prison and then applied and was accepted to the Seattle University School of Law. Despite foreclosure, bankruptcy and a battle to keep her children, Simmons thrived. A 3.7 GPA. The Dean’s Medal. An appointment by Gov. Jay Inslee to the new 15-member Statewide Reentry Council. And she was the first Seattle University graduate to receive the prestigious Skadden Fellowship, awarded to a law-school graduate focused on public-interest law. And yet, the Washington State Bar Association’s Character and Fitness Board recommended Simmons not be allowed to seek a law license. She had a “sense of entitlement” regarding her fellowship, the committee said. There was a risk she might relapse, or reoffend. And was five years really long enough for a person to change? — argued that people can be redeemed. Hopwood, who was the subject of a “60 Minutes” profile for his dramatic turnaround, is living proof. And so, he argued, is Tarra Simmons. After just four hours of deliberation, the judges unanimously voted to let Simmons take the bar exam last February. She passed, and on June 16, Simmons will be formally sworn in at the Seattle University School of Law. State Supreme Court Justice Mary Yu, who wrote the 33-page opinion allowing Simmons to sit for the exam, will be the keynote speaker. 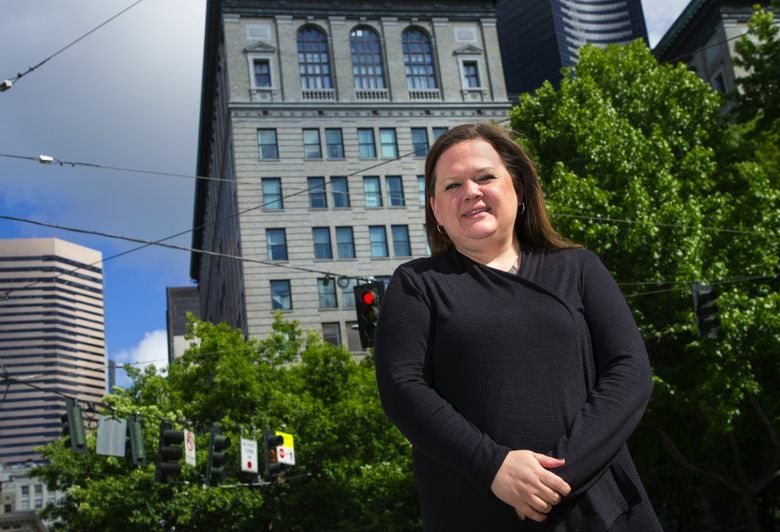 One recent morning, Simmons sat in a coffee shop near the Pioneer Square office of the Public Defender Association, where she does legislative work. She is 40, with a bright, youthful face. “There definitely is disbelief,” she said of the rugged path she took to get to this moment. Parents with drug problems. Poverty, homelessness, sexual abuse and, later, addiction and the crimes she committed to pay for it. Assault. Possession of a firearm and controlled substances. She remembered working at Burger King and having her wages garnished to pay her court fines. She thought maybe she would just sell drugs — and not use them — in order to make ends meet. But she also remembered reading Hopwood’s book, “Law Man,” and the law students who came to the Washington Corrections Center for Women in Purdy, Pierce County, to talk with inmates about their rights. As part of her swearing-in celebration, Simmons is hosting a fundraiser for Civil Survival, which helps those who have been in prison to re-enter society and seeks to change their legal and financial obligations. Simmons is the executive director. Simmons understands what the bar association’s committee might have seen on paper — but wishes they had seen her as a person. “Obviously, my record is bad,” she said. “But I have done everything in my power to prove that I am not what it says I am. And where the character-and-fitness board saw entitlement, Simmons saw pride. “It’s a stereotype we give to women,” she said. “We’re not allowed to be proud of our accomplishments. Simmons lives in Bremerton with her husband, son and stepdaughter. She met her husband in recovery, and got to know him after he helped move her out of her foreclosed home. “Ever since then, he has stepped up and been as solid as a rock for me,” she said. Simmons still carries $300,000 in student loans, and hopes that after working in the nonprofit world for a decade, those debts will be forgiven. “I am a spiritual person,” she said, “and I absolutely believe that my higher power has paved the way.